Sue Vorenberg at CannaMan Farms in Vancouver, early 2014 before the first stores opened. So, recreational marijuana’s been on the legal market in Washington for nearly a year now, and maybe you haven’t tried any yet. Yes, believe it or not, not everyone who reads Cannabis Chronicles partakes. Or maybe you’re curious about how to become more attuned with the subtle differences between the strains you’ve tried. Well, my friend and former colleague Sue Vorenberg knows a thing or two about marijuana. She did create this blog after all. And before that, she spent lots of time covering the birth of the fledgling recreational marijuana industry here in Vancouver, which happens to be home to two of the state’s highest grossing pot shops. After leaving The Columbian for a social media job at Main Street Marijuana, Sue’s become an open connoisseur and an expert voice on local cannabis culture. So, if you’re looking for an informed opinion on how to develop a palate for marijuana, look no further. Check out Sue’s recent Cannabis 101 post, which I’ve re-posted below from her new blog. If you’re new to cannabis, or returning after a long hiatus, you may find yourself in a vastly different world of products than the one you grew up with. The legal recreational market is very new, and curiosity about the variety of strains abounds. In fact, there are 100s of strains, which can make the process of figuring out what to try a bit daunting. So, with that in mind, I thought I’d describe my own system and how I’ve been developing my palate. When the first stores opened in Washington, I had little experience with any strains or variety. I smoked pot in the 1980s but stopped for about 20 years. I started again in 2014 because as a reporter covering the industry I wanted to understand more about the realities of marijuana and why people use it. For a basic overview – there are three general strain types: Sativa, Hybrid and Indica. Sativas are the energetic daytime strains good for hiking, cleaning up around the house or working out, among many other things. Indicas are evening or nighttime strains good for relaxing on the couch, contemplating or preparing your mind and body for bed, among many other things. Hybrids are a mix of sativa and indica strains to produce a wide range of mixed affects – many growers will list whether their hybrids are sativa-dominant or indica-dominant, which can give you some idea of whether the strain will be more relaxed or more energetic. To get started, I’d recommend trying one sativa, one indica and two hybrids. You’ll need a decent glass pipe (which doesn’t require a screen like pipes did in the old days), a grinder (somewhat optional but it can make your smoking experience far better), a lighter, and the smallest bag of each strain – if you can get 1 gram bags or smaller that’s ideal. Leafly has a great deal of information about many strains, including their medical properties, so if you’re looking for something specific in that vein, I’d highly recommend surfing around the site for details. Hybrids: Blue Dream (the king of hybrid strains and a good mix of active energy and relaxation) and OG Kush (a heavier West Coast hybrid that is good for taking the edge off after a stressful day. OG Kush is also the backbone of several other hybrid strains. OG, by the way, likely stands for Ocean Grown, although the full history of the name is still a bit mysterious). Of note, you can also buy a pre-roll of each variety if you want to skip the pipe and grinding, but that said, if you really want to become a gourmet the best place to start is with un-ground flower. After you get your starter pack home, pick which strain you want to start with. Whenever I try a new strain, I fill out a strain sheet with details about how it made me feel. Here’s a link to a .pdf of the sheets I fill out: StrainSheet. I like to collect that information because it helps me understand the differences between strains and how they affect me. And of note, each strain affects each person somewhat differently, so it’s important to experiment a bit and discover which ones work best for you beyond just looking at reviews. So let’s say you start with Blue Dream. Open the package and look at the buds, maybe even take a picture of them before you grind them. 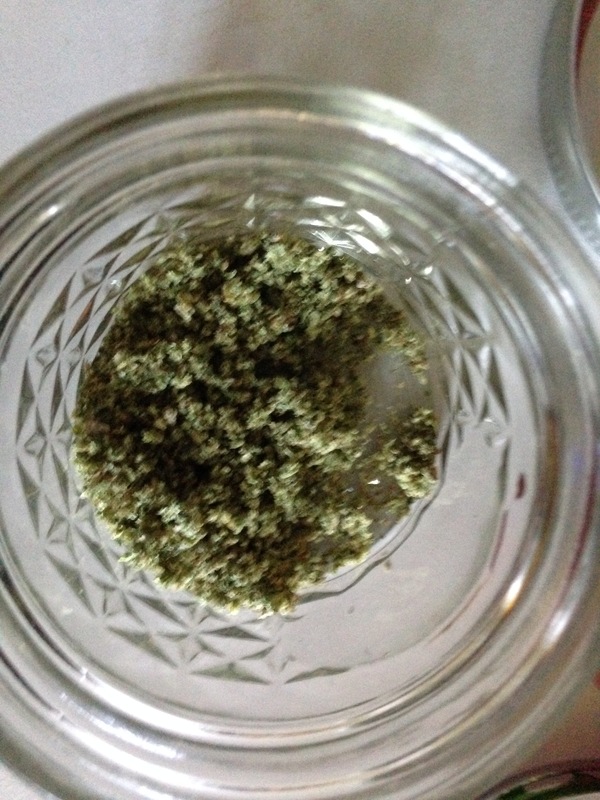 Once you do that, grind the buds. 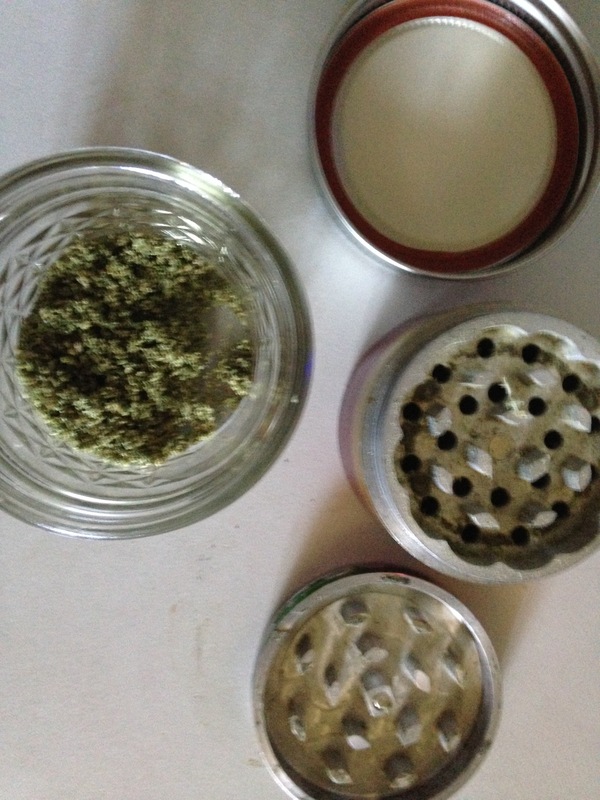 There’s a great 101 post about that on Cannabis Chronicles here: Cannabis 101: Grinders. After experimenting a bit, I’ve found that 4 ounce jelly canning jars make the perfect storage containers for your ground up bud. 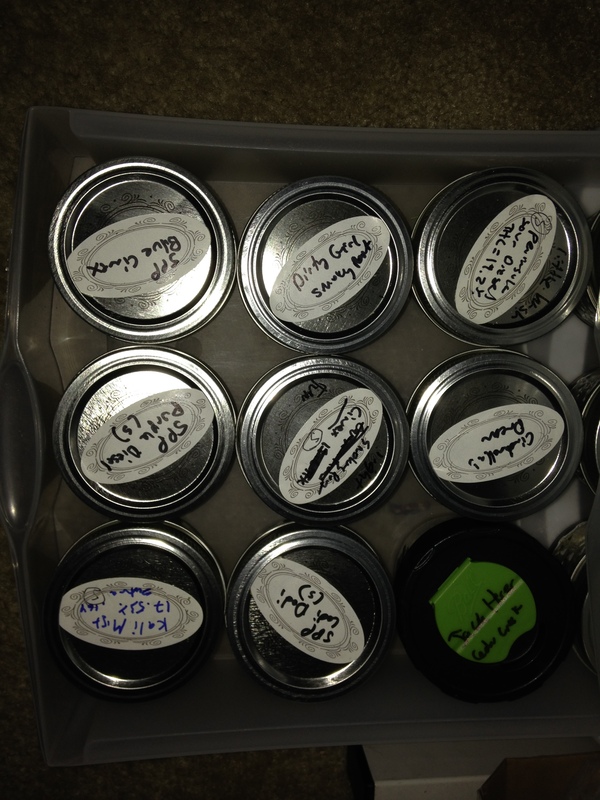 I have a larger plastic drawer case where I sort mine by sativa, hybrid and indica for later use. Once you’ve ground the flower and have it stored either back in the bag or in a jelly jar, give it a good long sniff and see if you pick up any specific notes. Those notes – like pine, citrus, berry or skunk – can usually give you an idea of the terpenes in the strain (I’ll do a post about terpenes soon). Terpenes can tell you a little bit about how a strain might affect you, for example pinene (that pine smell) can be associated with the alert and active properties of a sativa. From there, pack up your pipe bowl and smoke one hit, holding it in for a few seconds and then blowing it out. Don’t take more than one hit when you first try something, because strains that kick in slowly can end up overwhelming you if you take too much. Take note of the time it took to kick in (some strains are instantaneous, some take five or six minutes) and how it made you feel. Note both the positive and negative aspects of the strain and whether it’s something you’d buy again or not. Note how strong it is – and whether you wanted to take another hit or not after the feel reached its full effect. If you find you prefer indica, sativa or hybrid strains, try more of them. 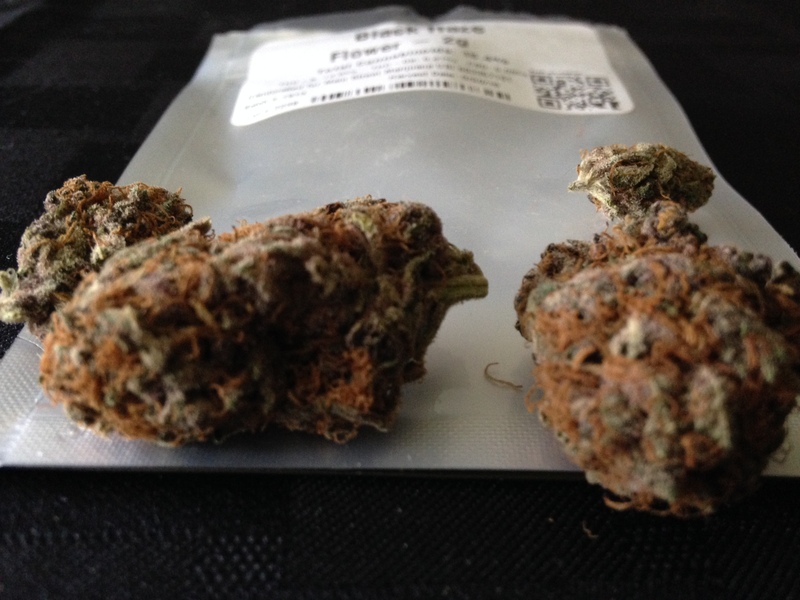 For instance, if you find you enjoy Cinex, you can try the same strain from a different grower or advance to other sativas like Jack Herer or Sour Diesel. I find that personally I like having a variety of types around. Some I will use when I’m planning to be out and active, others I’ll use for chilling out and watching TV, and still others I’ll use before bed. As you learn more about how your own body responds to different strains, you’ll want to keep a few of your favorites on hand in larger quantities (which can be cheaper when you buy more). Hope this helps you get started! If you have questions, please feel free to ask in the comment section!